​The Valley Historical Society, which has the same boundaries as the Cassadaga Valley School System, is supported by the towns of Charlotte, Gerry, Stockton, and the villages of Sinclairville and Cassadaga. The Historical Society was chartered in 1984 by the New York State Board of Regents. Meetings are 7:00 pm on the first Tuesday of the month, and are often held in the Museum in Sinclairville, New York. The Museum is open from 2:00-5:00 pm on Sundays from May through September, and other times by appointment. New members and visitors are always welcome! Friday, August 4th, 6 pm-set up for Annual Quilt Show. Tuesday, September 5th, 7:00 pm, at the Museum: Program: Brenda Cavallaro, Falconer Historian. ​Finalize plans for the History Fair. Refreshments: Apple Pie and Cheese by Larry and Carol Barmore. Saturday, September 9th, 7 am - 9 pm: Nineteenth Annual History Fair. Tuesday, October 3rd, 7 pm: At the Sinclairville Free Library. 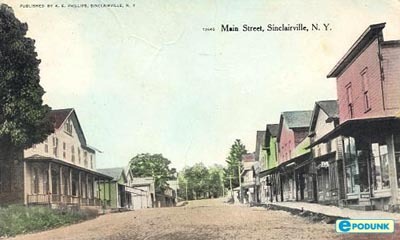 Program: Larry Barmore speaking on the Lost History of Sinclairville. Refreshments will be served. Tuesday, November 7th, 7:00 pm, at the Cassadaga American Legion #1280 - Pomfret Historian Todd Langworthy, Nomination of officers for 2018. Refreshments will be served by Diane Shaw & Lois Anderson.